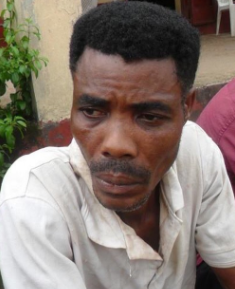 A middle aged man identified as Abraham Moses Udoh, has been arrested by men of the Cross River State Police Command for allegedly selling his two-year-old son, Elisha, for N150, 000 in Calabar, the state capital. Parading the suspect before newsmen, the state commissioner of police, Hafiz Inuwa, said Udoh's wife reported him to the police after she discovered what he had done with their child. “On July 24 at about 0200hrs, a case of child trafficking was reported at Uwanse Divisional Police headquarters, Calabar, by one Mrs. Esther Abraham of No 2 Amika Utuk Street, Calabar, against her husband, Mr. Abraham Moses Udoh of the same address, who stole away her two- year old boy, Elisha Abraham, without her consent. Hafiz added that the child would soon be found and the suspects charged to court.